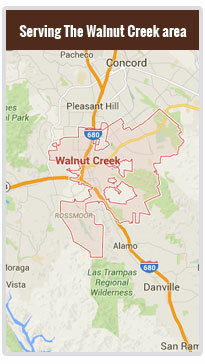 Our team at Shield Towing is dedicated to taking care of the Walnut Creek community, which we are proud to be a part of. Anytime you need emergency towing or other roadside services, we are here. Our licensed and bonded technicians have years of experience and we stand behind our honest pricing policy so you won’t empty your pockets. We perform roadside assistance and emergency towing with the cooperation of an independently owned and licensed tow truck operators. Timing is crucial during a car breakdown scenario. You don’t have to get nervous if your car won’t start. We know you don’t have time to lose, thus our 24/7 trustworthy services will never let you down! Shield Towing is the company you can rely on. We will arrive to your roadside location timely and give your engine the quick boost it needs. Getting a flat tire fixed can be a brage. Sometimes you don’t have time for a flat tire fix. Other times you don’t have tools on hand. And sometimes you just don’t want to end up crawling around in the looking for loose lug nuts. Shield Towing knows how you feel, and our roadside assistance team is ready to get that flat tire fixed so you don’t have to face it alone. Remember that sinking feeling in your stomach? The one you had last time you found yourself with a car lockout? We do. And our roadside assistance team is ready to get rid of it! With Shield Towing team on the job a car lockout will be nothing more than a story for the water cooler crowd.